"Why can't I record my favorite band's CD into the computer, then view it in the Staff view?" "After I connect MIDI cables from my keyboard to the computer and record into Sonar Home Studio, why do I still need to have the keyboard connected to hear what I played? Isn't what I recorded stored in Sonar Home Studio?" "Do I have to be a rocket scientist just to understand how to record and edit my songs?" The answer to this last question is definitely "no", even though it sometimes seems like everyone else doing this stuff must have studied it for years. Once you understand the basics of how MIDI and digital audio work, the first two questions will become easy to answer yourself. MIDI is a set of commands or instructions that different hardware devices and software programs use to communicate to each other. These MIDI commands are pretty much useless by themselves. They need to work with other devices to get the end result you're looking for. When you press a key on a keyboard, that command is sent to the internal synthesizer patch you selected, and /or to the port on the back of the keyboard that says "MIDI Out". That command by itself makes no sound. Along with other information, it's just the instruction that says, "play this note". As an analogy, think of a player piano. There is a paper roll that you put into the piano containing the song that you want to hear the piano play. The roll has holes in it that correspond to the notes on the piano. As the roll turns the piano plays the notes. 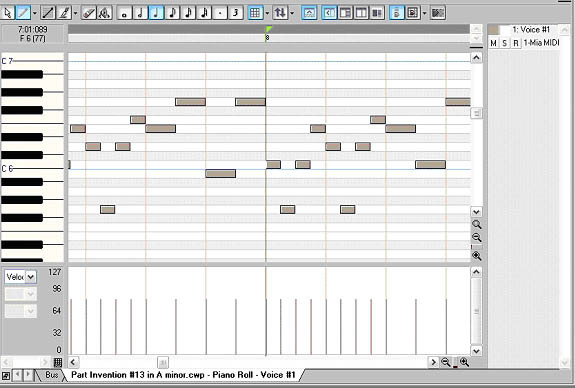 Like MIDI commands, the piano roll is pretty much useless by itself. The piano roll and the piano need each other to get the end result that you are looking for, which is to hear the song play. A note you press on the keyboard (which is a MIDI command) travels down the MIDI cable into your computer. Once there, you can have Sonar Home Studio record it, and send it out to a device (like your keyboard, or a sound card's internal synthesizer) so you can hear it. Sonar Home Studio will also allow you to view what you recorded so you can further improve or change different aspects of your performance. Each of the views above display the same MIDI performance, but each have their own advantages when it comes time to edit or change any of the MIDI commands. The Sonar Home Studio User's Guide and online internal documentation explain each of these views in detail. There is no sound contained in the MIDI information itself, so you will always need some kind of device to play the MIDI commands back, or you will not hear them. Some examples of these MIDI devices used to playback the MIDI commands would be a keyboard's synthesizer, a sound card with a built in synthesizer, a stand alone MIDI module, a drum machine, or a software synthesizer. But remember, every device you playback on may have different sounds, so your file may not always sound exactly the same when you play it on different devices. To put it simply, what you play is recorded, but what you hear is not. Audio, or maybe more appropriately for this discussion "sound", is produced when air molecules bump into each other, caused by a vibrating object. When this type of information gets stored in your computer it's referred to as Digital Audio. Digital Audio is a numeric representation of sound, and is the way Sonar Home Studio stores the sound. 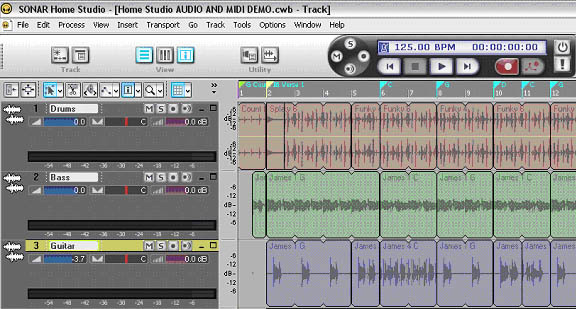 A typical example of audio stored in Sonar Home Studio would be the human voice. Your vocal chords vibrate, causing the air molecules to bump into each other. A microphone converts those air pressure changes into voltage changes, then your sound card on your computer changes the voltages to digital audio. When you record from a microphone, Sonar Home Studio stores the information as Digital Audio, not MIDI. Recording through the line inputs of your sound card will also allow you to record audio into Sonar Home Studio. For example, you could connect a guitar, bass, mixer, CD player, or even the audio outputs of your keyboard's synthesizer (not MIDI outputs) to the line inputs of your sound card. All will result in Sonar Home Studio storing the information as Digital Audio. 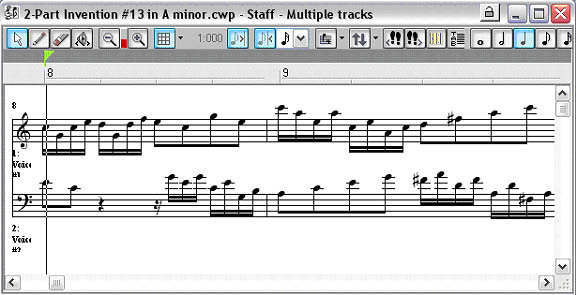 Unlike MIDI, Digital Audio cannot be displayed as notation. For this reason, you cannot view recorded audio in Sonar Home Studio's Staff view or Piano Roll view. Instead, audio is displayed as waveforms in the Track View where all audio editing can be performed. Here is the Track View with recorded audio present. When recording into Sonar Home Studio, you have basically two choices, to record MIDI or audio. They both have their advantages and disadvantages that you will learn as you gain more experience. But it's important to remember that MIDI and Digital Audio information are different types of technologies, and require you to work with them in different ways. At this point you may already be able to answer the first two questions at the beginning of this document. Before reading the next paragraph, read the questions again and see if you can come up with an answer, based upon what you have learned so far. 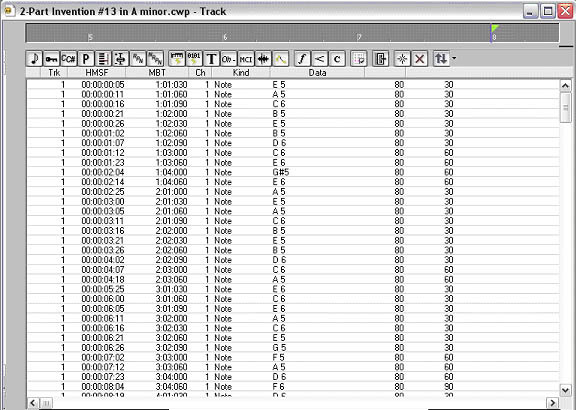 The first question assumes that anything recorded into Sonar Home Studio can be viewed in the Staff view. You now know that only MIDI data can be viewed in the Staff view, and that if you record from a CD player, Sonar Home Studio will store the information as digital audio. So, it's impossible to view the recording of the CD in the Staff view. The second question assumes that when you record from your keyboard, what you play and what you hear are both recorded into Sonar Home Studio. You've leaned now that when you send MIDI commands from your keyboard, only the performance that you played is recorded into Sonar Home Studio. For more information on this and other MIDI and Digital Audio topics, please check out the online version of The Desktop Music Handbook.